There is no need for us to spend much time introducing the Samsung Galaxy S5 – a smartphone that has been enjoying plenty of attention both before and after its announcement. Critics and media have been building up hype around it for months, and now, there are surely millions of people eager to learn whether or not Samsung's newest flagship is really worth picking. Well, for them we already have a clear answer – the smartphone is a winner anyway you look at it. 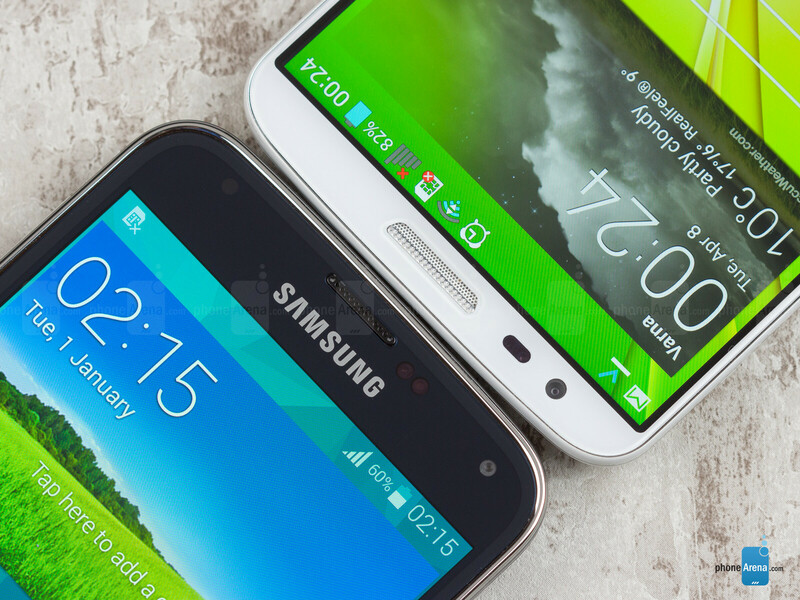 How would it stack up against some of the other flagships, however? Is the LG G2, in particular, a serious alternative to the Samsung Galaxy S5? These are the questions we'll be seeking the answers to today. 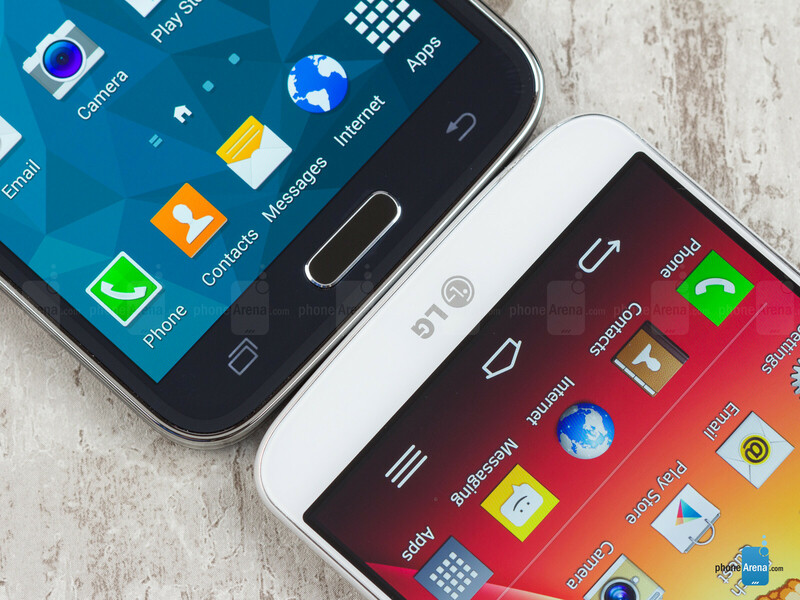 Now, you won't be wrong if you point out that a comparison between the Galaxy S5 and the LG G2 isn't exactly a fair one. After all, the former is a brand new flagship packing all the latest bells and whistles, while the latter has been around for almost 8 months now. Yet on the other hand, the LG G2 should not be underestimated as it still packs quite a punch. And besides, it has the advantage of being more affordable than Samsung's latest high-end handset, so at the end of the day, the G2 could be the better deal overall. Let's dive into it and see whether or not that's the case. Like all other Galaxy S smartphones before it, the Samsung Galaxy S5 sports a plastic shell. The chrome-like plastic trim around the sides looks quite familiar as well. What's new, however, is the finish on the back cover – a shimmering paint job has been applied, complemented by a perforated pattern. The result is a phone that looks quite fashionable without going over the top with the bling. Furthermore, you get a choice of four fabulous colors, including black, white, blue, and gold. Similarly, the LG G2 is also a plastic-made phone, but it is a step behind the Galaxy S5 when it comes to appearance. It is not a bad-looking phone, of course, but it is still rather conservative and uninspiring. Its glossy finish and plasticky construction would hardly wow anyone, ourselves included. Color-wise, the LG G2 comes in white or black, although if you're lucky, you might be able to grab one of those limited edition gold or red variants. 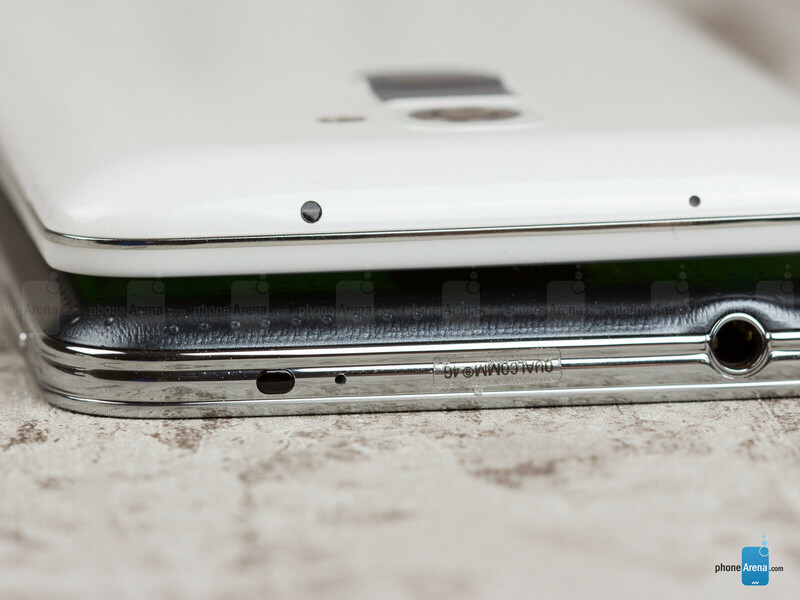 We see no fingerprints sticking to the back of the Galaxy S5, which is good news. At the same time, the phone's finish provides sufficient grip, which allows us to get a really comfortable hold onto it. Some finger traces do get stuck to the LG G2's glossy back, but they're not too easy to spot. Removing the back cover of the Samsung Galaxy S5 is a matter of lifting it up gently at the dedicated slit. 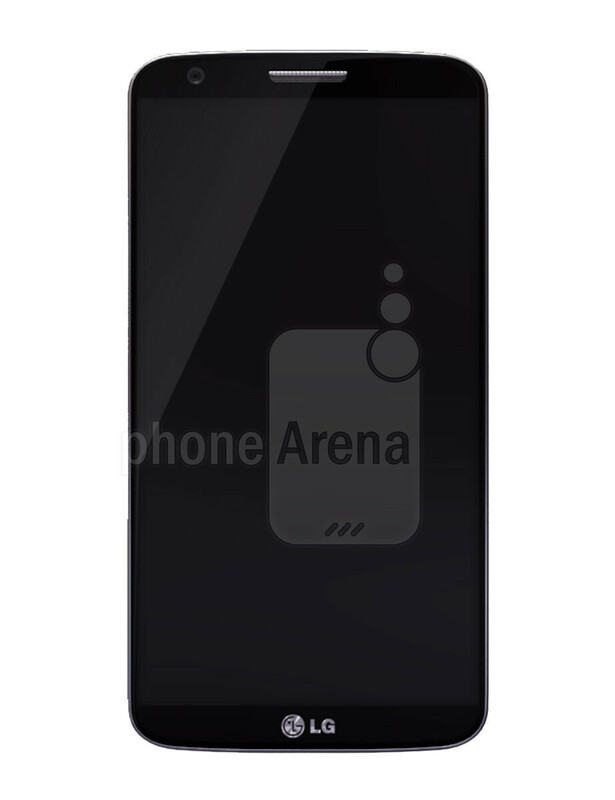 Once the lid is off, the phone's user-swappable battery and microSD card slot become exposed. The international LG G2, which we are using for this comparison, lacks a microSD card slot and its back cover is non-detachable. The non-removable battery that LG has thrown in, however, is slightly larger in capacity compared to the S5's. It is of the “stepped” variety, meaning that its shape occupies any “dead space” that may form between the LG G2's body and back plate. 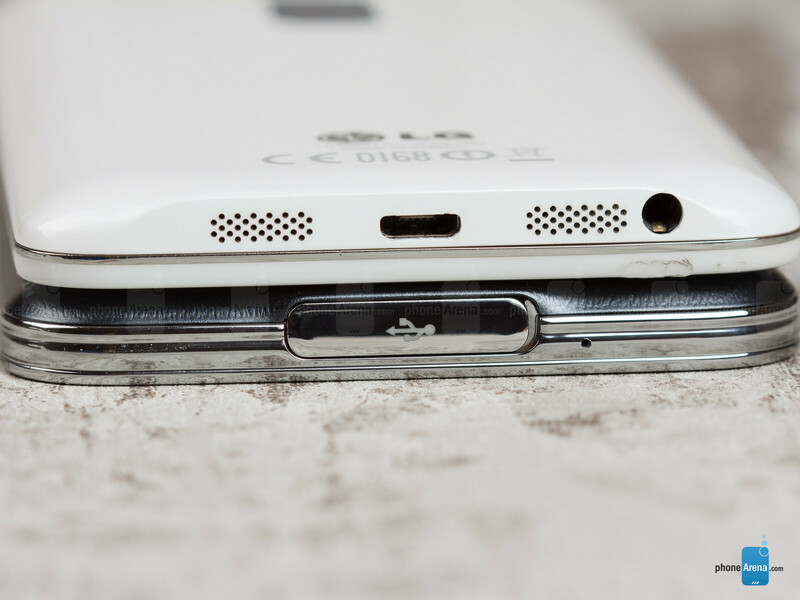 LG deserves credit for managing to squeeze a 5.2-inch screen inside the G2. In fact, LG's flagship is a tad more compact than the Samsung Galaxy S5, which has a slightly smaller, 5.1-inch display. Still, the size difference between the two is negligible – both smartphones are of adequate size for a contemporary flagship. Similar words can be said about their weight. 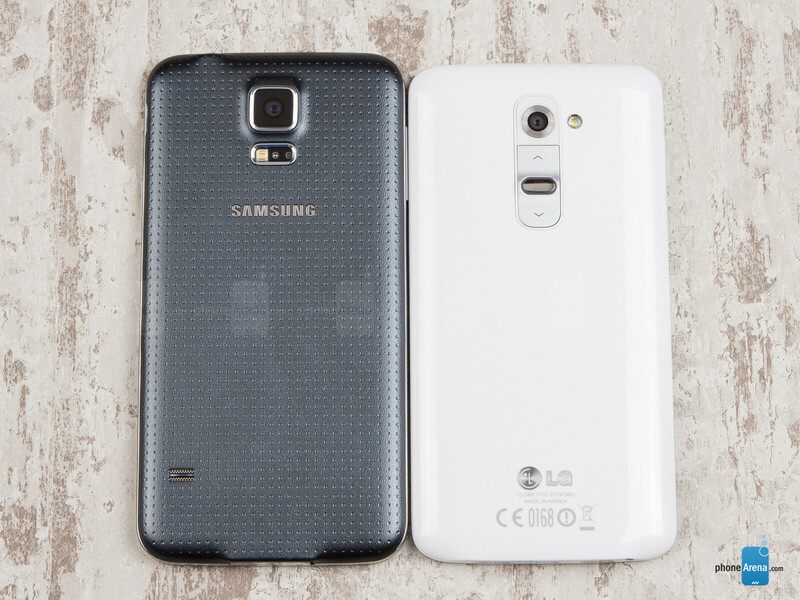 The Samsung Galaxy S5 weighs in at 5.11 ounces (145 grams), while the LG G2 weighs slightly less at 5.04 ounces (143 grams) – a difference that your hands won't be able to feel. The phones are neither light, nor too heavy for their size. Speaking of size, phones of this caliber are tricky to use single-handedly, and this goes for both the S5 and the G2 as well. We must note, however, that the LG G2 has a clever trick up its sleeve – a special screen mode that squeezes the whole UI down to a fraction of its size and places it in the corner so that your thumb can reach even its furthest areas. You enter and exit this mode by swiping the on-screen home key to the side. In case you're wondering why a flap cover is protecting the Galaxy S5's microUSB 3.0 port, that's because the phone carries an IP67 rating. In plain words, it is resistant against dust and water damage – you should be able to take the Galaxy S5 in the shower with you without that resulting in any liquid damage occurring. We don't encourage dunking it in the pool for grins and giggles, however. 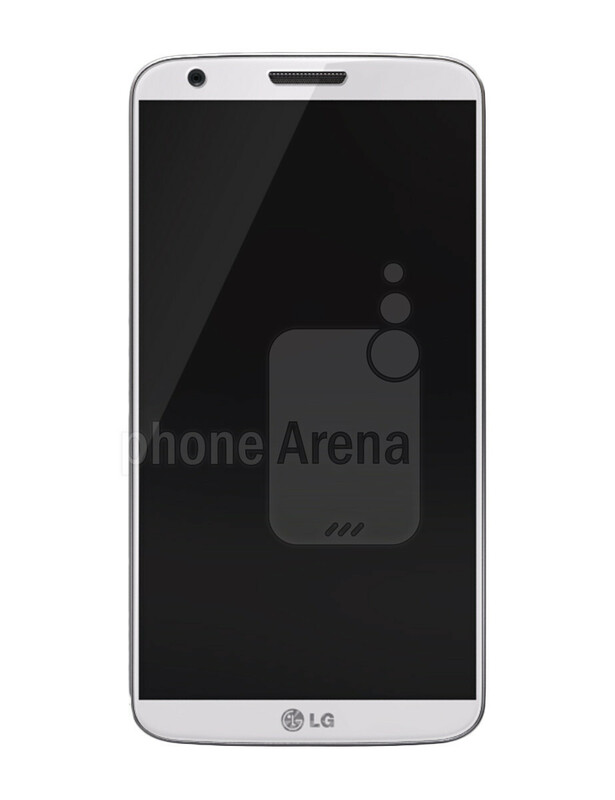 The LG G2, on the other hand, is not a water-resistant phone, so it would be wise to keep it away from liquids. One peculiar thing about the LG G2 is that its power and volume buttons are placed on the back. We've said numerous times that this design feature isn't for everyone – you'll either like it once you get used to the keys' placement, or you won't. Samsung is playing it safe with the Galaxy S5 by leaving the power and volume buttons in the places where they're usually located, at least as far as Samsung smartphones are concerned. On the left side of the Galaxy S5 is its volume rocker, while the power key is on the right. Below the screen of the Samsung Galaxy S5 we find a set of Android navigation keys, all of which work perfectly fine. The large, easy-to-press physical "Home" button in the middle has an embedded fingerprint scanner used for unlocking the phone with a swipe instead of entering a PIN or pattern. It can also be used to authorize PayPal purchases, yet it can't be used instead of your Play Store credentials. Overall, we don't mind having it at our disposal – it adds an extra layer of security preventing prying eyes from checking out our personal stuff. However, its execution isn't optimal. You see, the swiping gesture can be tricky to pull off as the user has to slide their finger straight down. Swipe your finger at an angle and you're likely to get a “Try Again” message. In comparison, the Apple ID in the iPhone 5s is a prime example of how a touchscreen sensor should be implemented on a smartphone – it requires no swiping and works from all angles. As for the LG G2, it doesn't have a fingerprint scanner. Instead, the Knock Kode feature acts as a replacement for the traditional PIN or pattern solutions. The Android navigation keys on the LG G2 are virtual, built into the smartphone's UI. The “Home” key is in the middle, the “Back” key is on the left, and the button on the right displays a list of options. The recent apps list is accessed by long-pressing on the home button – a working solution, although a dedicated key for the purpose might be considered more useful by some users. Full HD, 1080 by 1920 pixel displays have long become the norm for a high-end Android smartphone, and sure enough, that's what we see on both the Samsung Galaxy S5 and the LG G2. As we already mentioned, the former's panel measures 5.1 inches in diagonal (432 ppi), while the latter sports a slightly larger, 5.2-inch screen for a pixel density of 423 ppi. With these figures in mind, it comes as no surprise that both screens produce excellent details, be it while displaying video, pictures, or plain text, and you won't be able to spot an individual pixel without looking through a magnifying glass. But there's more to a smartphone screen than its resolution. Samsung is once again using a Super AMOLED display with a Diamond Pixel arrangement for its flagship, while LG is sticking with an IPS LCD screen with True RGB pixels. To the naked eye, both displays look outstanding – bright, vivid, with punchy colors even at an angle. Our measurements, however, tell a slightly different story. The Galaxy S5's Super AMOLED screen has several different screen modes, which you're free to pick manually from the phone's display settings. Or you can just let the phone decide what's best by activating Adapt Display (we chose to leave it off for our tests). In Standard mode, the S5's screen produces a color temperature of around 8000 Kelvins, which is far from the reference point of 6500K. In simple words, whites appear colder, with a blueish tint. Switching to Professional mode brings this figure down to 7200K, which is more acceptable. The LG G2 doesn't perform well in this category with a color temperature of over 8100 Kelvins. Furthermore, our measurements confirm some slight deviations in the Delta E Grayscale parameter, with the Galaxy S5 in Professional mode being slightly more accurate than the LG G2. Overall, both screens have their imperfections when it comes to color reproduction, but in reality, these aren't too distracting, and the average user probably won't be bothered by them much. We took both phones outside for a quick outdoor visibility test, and the results left us satisfied. The Samsung Galaxy S5's screen can shine brightly, while its glass surface does not reflect much of the sunlight that hits it. Similarly, the brightness output and low reflectance of the LG G2's display make it useable under broad daylight. I still don't see the while concept behind the om screen buttons, never understood why google shifted to this direction, and will always chose a phone with physical/capacitive buttons over on screen ones. Ditto. That's why I chose the DROID Maxx over the Moto X, but was severely underwhelmed by it so I rolled with the Note 3. I'm curious to see if the multitask button on the S5 can be changed to a menu button. g2 any day! !It has a far better camera & obviously cheap! The G2 buttons on the back are actually quite nice once you get use to them, I never have any issues with them like I do with the side ones on other phones. When I gave up my S3 for the G2 I was not disappointed, it's an awesome phone. G2 is out performing S5 in some areas...I would go for G2 since it's €230 cheaper than S5 and the specs are almost the same. G3 SOON.......... as of now still G2 ! do you mind mentioning where the G2 oit performed the S5? unless and of course you didn't read the article, just like every other LG fanboy who commented in here. the G2 is 6 months old smarty pants. And try to read before you comment, not just this site but every other reviewer felt that the S5 is far better in design since it ditched the glossy plastic. And did you even bother reading the display part? the S5 has 4 different modes, 2 of them have more accurate color reproduction than the G2. And the G2 didn't do any harm for the S4 sales, actually nothing did, so why on earth do you think people will want it over the S5? yeah yeah, you again with the sales numbers, please...lols...hahahaaa. Pity on you, seriously..!! Try to read before comment?? Did you read my comment and also the things in the brackets?? C'mon super sammy boy..stop yelling at people having a different opinion than yours. And looks are subjective, and I clearly mentioned that. Btw, the G2 was announced in August 2013, so do the math. 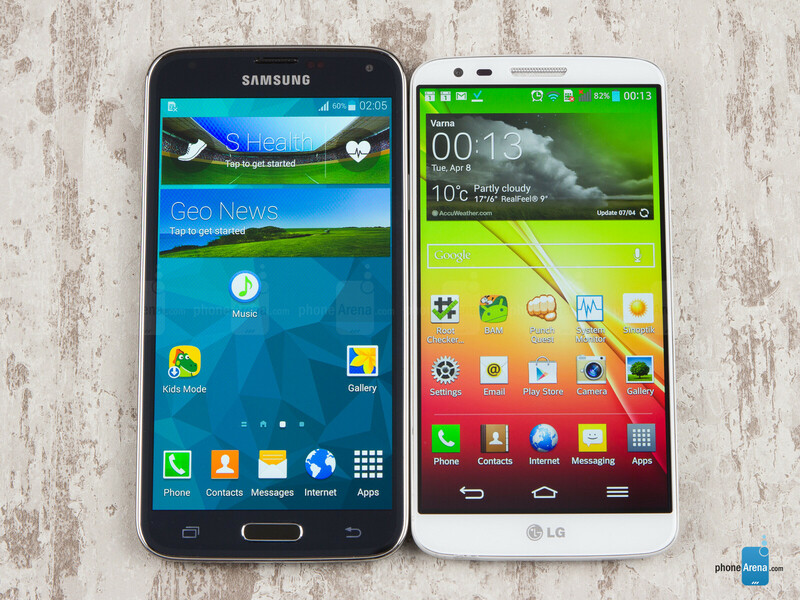 I would choose the G2 over the GS5 if it had the 801 instead of the 800 and if the buttons weren't on the back. 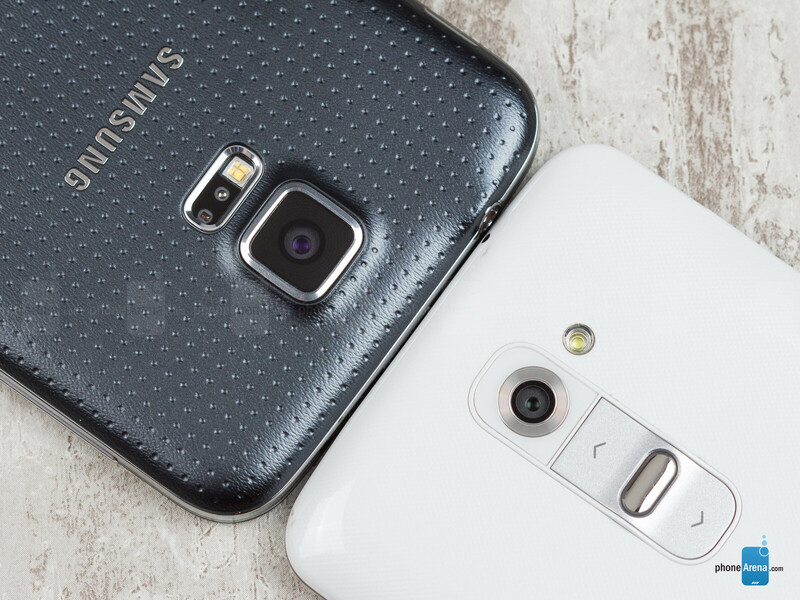 So unfortunately the GS5 wins hands down, although the G3 should beat the GS5 hands down. I had my Lg G2 for 6 months and hate it. Its still mint condition and its been freezing and the battery dies alot quicker than it suppose to. Thinking about switching to the s5. LG and my carrier cant find a single problem with me phone so if anyone has any tips let me know. Just FYI - This may not be an issue for everyone, but the S5 has issues with USB connectivity. It will only connect as a media device, it will not connect as a USB Mass storage device with a drive letter. Due to that you cannot access and edit files on the phone directly. I have also heard people having issues connecting to car sterios etc. GREAT phone other than that. How can these new phones not come with this basic feature?